A few months back, a home-educator very kindly shared the fact that Sky TV offer free educational workshops. She wasn't in a position to organise a trip herself, but shared the details so that others might. That was too good an opportunity to miss (and makes a nice change from a museum - lovely though museums are). I rang and spoke to a very nice lady who seemed to want to "reach out" to home-education groups (particularly for the school holidays), although at that point, they had never had a home-ed group participate and with the blind-faith that only someone who had never encountered a home-ed group visit, booked us in for two Sky Skill Studio sessions (morning and afternoon) on Monday 8 April 2013. I explained that home-educators aren't formal groups, as such. I tried to explain that no one was really in charge, it all revolves around yahoo groups and Facebook and the like. But we'd definitely fill it, one way or the other. Over the next few weeks, I had a couple of conversations with the lovely Lucy, which possibly made her wonder what she'd let themselves in for. I apologised for the daft questions but explained it really is best to minimise any "surprises" on the day. "No, they aren't all the same key stage." "They will range from 8-16, yes - all in one session!" "It'll be fine, honestly... erm, pitch it somewhere around KS3." The penny might finally have dropped during one of the later conversations. "No, we will be travelling separately, we won't need to arrange coach-parking and by the way, is there room for 15 or 20 cars to park?" There is a slightly horrified silence on the other end of the phone... "erm, no, there's room for about 6 cars at most,"
"Ah, is there a coffee shop where parents can wait?" "Ah, well, that would at least solve the parking problem, if there's nowhere to wait and drink coffee, then they won't need to park" I reassure her. Sky have spent a lot of time and effort on developing their workshop. It's clearly aimed at schools. 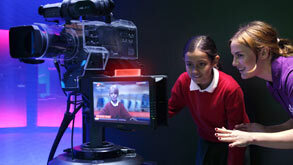 There are 16 national curriculum linked topics to choose from, covering all the major subject areas. For this reason, I had a moment of indecisiveness (ok, madness) where I decided I would let the 30 or so children so far booked on, take a vote on the topics. Each child could give up to 5 ordered preferences. The suprising winner was "World of Money" with "Natural Disasters" a distant second. There were up to 8 roles to choose from (producer, director, scriptwriter, camera operator, editor, presenter/reporter, eye-witness/expert). These roles are flexible, so children can share roles or take on more than one. Again, still not having learned from the whole voting thing, I let children (or their parents) choose which roles they preferred and whether they wanted to stay with siblings or not. So, on the day, despite my best intentions to arrive first at 9am, I arrived at 9.20 and discovered that half the people had beaten me to it. I blame the M25. There followed 20 minutes of pedantic name-ticking and coloured name badge distribution, and this was just on my part. Meanwhile the sky skills staff engaged in a bit of an ice-breaker activity, which was a good idea, since most of the children only knew a handful of other children. The tour leader explains what goes on in a lively and engaging manner and they answer any questions which come up. No question is too silly. Our group was mixed-age and he handled the difference in ability/comprehension quite well. This is where all the children can really get to work. Each group leader encourages the children to work together as a team (I get the impression that teamwork is a very important part of the Sky corporate culture. It's mentioned several times, in different contexts), they decide on a script, choose costumes, backdrops, footage and so on. Everyone plays their part. The Sky group leaders had an extra job on their hands, as the children did not know eachother (At best, each child knew three or four others in their group of six or eight), getting the group to work together. That said, the group I watched did brilliantly. Sky can accommodate groups of 32 participants and around 4-5 adults/teachers/parents. They will also take youth groups such as Scout or Guide groups. There is no charge for the visit but it needs to be booked in advance. The encourage youth groups to visit during school holidays. Schools may create a login via the Sky Skills website.